A budget crisis—and resolution—is a lesson learned for newly elected Congressman Scott Peters of San Diego. New members of congress often arrive in Washington agape at the scale of the nation’s problems, starting with the upward-spiraling federal debt and endless cycle of congressional budget battles. 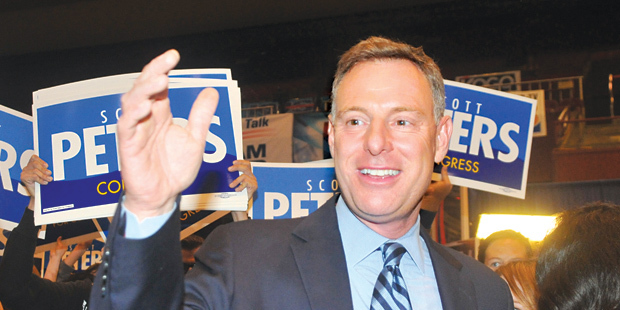 First-term Democratic US Representative Scott Peters ’84, however, is no stranger to acrimonious fights over spending and the size of government. As president of the San Diego City Council, Peters saw his adopted hometown engulfed in a fiscal crisis when the public pension system ended up more than a billion dollars in the red. The budget meltdown drove a mayor out of office, set off years of combat between elected officials and a zealous city prosecutor, and triggered a federal investigation of San Diego’s bond offerings. Peters and his council colleagues were ultimately exonerated in an inquiry—but not spared the task of turning around San Diego’s finances. Backed by Republican Mayor Jerry Sanders, that’s what the Peters-led city council did, pushing public employees to accept new pension agreements, cutting spending, and eventually putting San Diego in a position to spend again on infrastructure and community development. It’s probably an experience Peters would prefer to put behind him. During his 2012 campaign, however, he endured withering attacks for his voting record on the city budget. Peters ultimately defeated his opponent, Republican incumbent Brian Bilbray, by 2.5 percentage points—around 7,000 votes—after spending nearly $3 million in personal and family money. For better or worse, all that may have been the perfect preparation for serving in the 113th Congress. Peters obviously didn’t get into politics by being bent on slashing away at government. The son of a Lutheran minister, he worked at the Environmental Protection Agency after graduating from Duke University and found himself drawn to NYU School of Law because of its commitment to the public interest. Students there were “thinking about how to use the law to change things,” Peters says. For himself, Peters hoped to effect change on issues related to the environment and public development. After a stop at the white-shoe Minneapolis firm Dorsey & Whitney, Peters and his wife, Lynn, landed on the West Coast. There, he began to build a reputation in the San Diego community—first in private practice, then as a deputy county counsel who litigated high-profile disputes over a controversial waste-disposal facility in San Marcos, a suburb of San Diego. Colleagues who worked with Peters at the firm Baker & McKenzie and for the county describe him as an earnest, good-humored attorney determined to find areas of compromise. Republican real estate developer Fred Maas met Peters when the latter was serving as a pro bono attorney for the Sierra Club in the mid-1990s. Maas was seeking support from the environmental group for a development project and walked away impressed by Peters’s skill and fair-mindedness as a negotiating partner. If deficits and debt are at the top of the congressional agenda—just as they were for the San Diego City Council—they’re not the only issues Peters hopes to tackle. He won seats on the House Armed Services and Science, Space, and Technology committees, overseeing areas of importance to his local economy. That, after all, is why he says he ran for federal office, trading a sun-soaked life in California for a cross-country commuter job, representing a district he’ll have to fight hard to defend. “We love our surfers and we love our admirals, but [San Diego] is an adolescent city. It’s developing into what it’s going to be,” says Peters. He also sees similarities between the national legislature and the local city council on which he served.